This is all original except for the front fender and rear tires. Missing the ladder. I was going to make it a tanker truck but never got to it. I would like this to be a positive experience for both parties involved. For all trucks with cowl lights. DATE; 1920's. SCALE 1:10.…. Looks like the base of the shovel bucket was either replaced or repainted. It is about 20" in length.
. DATE; 1920's. SCALE 1:10.…. This sale is for 2 5" hard plastic cars. I believe these are made by Keystone and I think they are 1940's Cadillacs. The only manufacturers mark is B308 on the rear license plate. These are in really great condition. The finish is like new and there really is no wear. Offered for your consideration is This Awesome! Vintage Rare! Keystone Packard Pressed Steel Toy Hand Crank Hydraulic Dump Truck. It is 29” L x 10.2” H x 8.5” W. It has wear to the finish,but the decals are good except one which is half gone. It still retains a lot of its original color. I could not get the Hydraulics to work. This is a really real cool toy. Please view all the pictures. This is a wonderful toy! Don’t miss out on an opportunity to own a piece of toy history. This toy represents its self very well. This is one of many toys that I will be listing from an extensive collection. Please view my other listings. For all trucks and other toys with a crank. DATE; 1920's. SCALE 1:10.…. Offered for your consideration is This Awesome! Vintage Rare! Pressed Steel Metal Keystone MFG #45 U.S. Mail Packard Toy Truck Antique. It is 27” L x 10.7” H x 8.5” W. It has wear to the finish,the decals are worn, but viewable. It is super well made, there are many real cars on the road today that are not made as well as this toy. This is a really real cool toy. Please view all the pictures. This is a wonderful toy! Don’t miss out on an opportunity to own a piece of toy history. This toy represents its self very well. This is one of many toys that I will be listing from an extensive collection. Please view my other listings. Offered for your consideration is This Awesome! Vintage KEYSTONE PACKARD HUGE 31” #79 Aerial Ladder Fire Truck PRESSED STEEL Toy 1920’s. It is 31” L x 10.5” H x 8.5” W. It is in good solid condition, overall wear that can be expected of a toy of this age. All the crank mechanics work very well. The ladder extends into the air 46”. There is one side ladder missing. this can be viewed in the pictures. This is a wonderful toy! Don’t miss out on an opportunity to own a piece of toy history. This toy represents its self very well. This is one of many toys that I will be listing from an extensive collection. Please view my other listings. Offered for your consideration is This Awesome! Vintage 1920s KEYSTONE PACKARD HUGE 27” #78 FIRE ENGINE WRECKER PRESSED STEEL Toy TRUCK. It is 27” L x 10” H x 8.5” W. It has been repainted, there are a few chips in paint.all the crank mechanics work very well.there is a slight bend in the rear step were it has been bumped. this can be viewed in the pictures. This is a wonderful toy! Don’t miss out on an opportunity to own a piece of toy history. This toy represents its self very well. This is one of many toys that I will be listing from an extensive collection. Please view my other listings. Offered for your consideration is This Awesome! Vintage Rare! 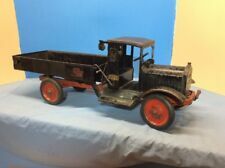 Keystone Packard Pressed Steel Toy Open cab Dump Truck. It is 27” L x 8.5” H x 8.5” W. It has wear to the finish,the decals are good.It still retains a lot of its original color. This is a really cool toy. Please view all the pictures. This is a wonderful toy! Don’t miss out on an opportunity to own a piece of toy history. This toy represents its self very well. This is one of many toys that I will be listing from an extensive collection. Please view my other listings. Offered for your consideration is This Awesome! Vintage KEYSTONE PACKARD 26” #54 Koaster w Skids & Hoist PRESSED STEEL Toy TRUCK 1920s. It is 26” L x 8” H x 8.5” W. It is in good solid condition, the bed has very little original red paint showing. The underbelly has red paint flaking. All the crank mechanics work very well. Please view the pictures. This is a wonderful toy! Don’t miss out on an opportunity to own a piece of toy history. This toy represents its self very well. This is one of many toys that I will be listing from an extensive collection. Please view my other listings. Offered for your consideration is This Awesome! Vintage Rare! Keystone Packard Open Cab Scissor Dump Truck Pressed Steel Toy 1924 Rare. It is 26.5” L x 8.5” H x 8.5” W. It is in good solid working order. It shows overall wear to be expected to a toy this age. This is a really cool toy. Please view all the pictures. This is a wonderful representation of a yesteryear toy! Don’t miss out on an opportunity to own a piece of toy history. This toy represents its self very well. This is one of many toys that I will be listing from an extensive collection. Please view my other listings. Vintage Keystone 1920s / 30s Pressed Steel Mobile Steam Shovel . Condition is Used.Very nice piece. Keystone HOOD BALLOON Pressed Steel Truck Tires (4) - REAL RUBBER! - Approx: 4 1/2" O.D. x 3" I.D. x 3/4" Wide. This is a survivor toy complete in the original Box with two cars and a truck' Looks like it wasn't played much. The truck and cars have rubber wheels and the box is plain so it is an early 1930 Toy. Vintage Keystone Plastic Blue Sedan 1950's Keystone Garage 4"
Vintage Keystone Plastic Red Sedan 1950's Keystone Garage 4"
This 27.5 in long pressed steel truck retains most of its original paint although it is faded. This will be a great candidate for restoration as it is very solid with no pitting. Missing the seat and rope/hook, otherwise complete and in great working order. STEAM SHOVEL Shovel Model 37. PRESSED STEEL. WE BELIEVE IT IS FROM THE 1920'S. THIS IS AN ANTIQUE TOY THAT IS VERY. THEY DON'T MAKE THEM LIKE THIS. WHAT YOU SEE IN PICTURES IS WHAT YOU GET! YOU'LL WANT THIS FOR YOUR TOY. It is all original. Paint is worn as expected. Original decals are there. Two are faded, others are readable. The original canvas bed cover is torn along one edge. Bed is missing the tailgate. One on the top cover support rods is loose on one end. Models - Keystone Models Mfg - Norscot - Norev - NZG - OHS - Overland - Sherwood - Shinsei - Sword - Tonkin - Truck Miniatures - TWH - Warner & Swasey - WSI Collectibles. Mfg by:Keystone Models Mfg Item Number: KMK-M001. For all trucks with peen axles. DATE; 1920's. SCALE 1:10.…. Red roof is 11 1/2" long and 8" wide floor to top of stack is 12" over all body is 9 1/2" tall 8" wide and 13" long. Antique Keystone Steam Shovel made on December 15, 1925. Made of all metal with a rope crank. Only thing missing is the small door on the back. Antique 1930's Keystone Pullman ride on train, made of heavy pressed steel. The train appears to have been painted and it is chipping and cracking in areas. It is missing one set of wheels, but does not impact it from rolling because there are double sets of wheels on both the front and back. VINTAGE KEYSTONE LADDER FIRE TRUCK PRESSED STEEL 23" CLOCK WISE WIND UP "WORKS"
THIS IS A RARE CLOCK WISE WIND UP WORKING KEYSTONE LADDER FIRE TRUCK, ALL SPRINGS ARE STRONG. TRUCK IS 23" LONG FROM END OF LADDER TO FRONT OF TRUCK. Keystone Steam Shovels And Trucks. Small booklet, about 6" x 4". We can work with just about any schedule. Early P.S. Truck. Size 27 inches long. Very good condition throughout with previous restoration. A nice example of this rare truck. Great Holiday or Birthday Gift. I am not an expert on this type of toy, so please ask any questions prior to bidding. For all trucks without a front crank. DATE; 1920's. SCALE 1:10.…. And the Dump Arm still works. Sit is still very straight and steering still works Great. 1920's KEYSTONE PACKARD HEAVY PRESSED STEEL AERIAL LADDER 79 FIRE TRUCK.Passenger side front fender slight tweak,overall metal is straight. Missing steering wheel, bell, 2 ladders and chain? Condition is Used. Shipped with USPS Priority Mail weighs 18 pounds packed, 36" x 14" x 14" shipping is $20.00 to $65,depending on location. Keystone police patrol truck. pressed steel, old and very cool. Up for sale is an Original Keystone Pullman Ride On Train Car. Made by Keystone with original label. Steering wheels turn, but the connection between the rod and wheels is broken, a weak point on these. This beautiful truck is set up with the hand cranked pump in the front under the hood and all connected to the tank and hose. The pump does turn on this large 28" long fire truck. Very well done with the front brass bell and steering. Displays well overall good condition. See pictures. Make: Keystone. You could drain the "oil" by pushing the plunger in the hood, the hood opens to reveal the engine. It has a hole in the truck so you can "fill" the tank. Antique 1920s original Keystone Packard Aerial Ladder 79 Fire Engine Truck. Made of pressed steel. Extremely RARE and hard to find in this condition. The paint is still very nice and the decals are in very good condition. The tires and rims are in great condition as well. This 1920’s Keystone Firetruck is believed to have all of its parts, including the ladders. It does have some play wear, small scratches, etc. No dents to speak of. The dimensions on this original Keystone Firetruck are 30” long x 8” wide x 3 feet tall (with ladders extended). She’s a beauty. Please see photos for additional description as to exactly what you will receive. Made by Keystone MFG Boston Mass. Everything turns as it should. See pictures for condition. All show wear. The blue is keystone and the yellow acme Vintage Keystone Plastic Toy Car Plus Others. Condition is Used. HERE WE ARE SELLING A GORGEOUS 1930'S KEYSTONE PRESSED STEEL 6500 LOCOMOTIVE STEAM ENGINE TRAIN SET - TOY IS IN ORIGINAL MINT CONDITION - IT WILL BE HARD TO FIND A MORE COMPLETE AND THIS CONDITION SET - COMES WITH RARE WRECKER CAR, PULLMAN CAR, ENGINE AND GONDOLA - ENGINE MEASURES ROUGHLY 30 INCHES LONG AND 12 INCHES TALL - PLEASE NOTE THE PHOTOS ARE PART OF THE DESCRIPTION - SEE PICTURES BELOW AND CLICK TO ENLARGE & SCROLL TO ZOOM FOR DETAILED PLAY WEAR AND CONDITION - MORE INFORMATION BELOW PHOTOS ON SHIPPING AND TERMS. Keystone 1920's Packard U.S. Army Transport Truck Original Steel, AWESOME LOOK!! All Original ! The drawstring cords for the canvas canopy are gone. C. Wheels roll freely. E. Steering wheel and front wheels turn as they should. SALES CODE: 499-000.